DEAR PAPERLICIOUS: Need a Hug? Love everything about this sentiment from You Are My Fave by The Stamp Market. 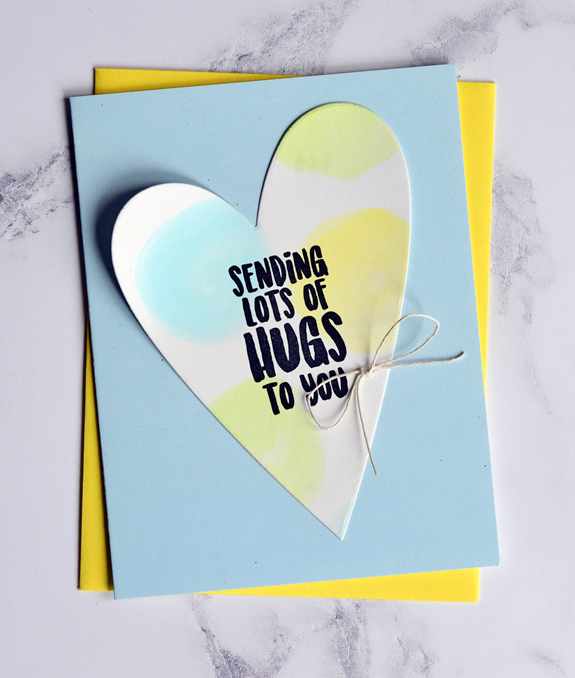 Watercolored green, yellow, and blue circles onto Bristol Paper and die cut with the largest of the Essentials by Ellen Folk Heart dies. The Bristol paper is a bright white and can handle light watercoloring without warping too much. Works very well with the Kuretake Zig Clean Cut markers that I used to make the circles. Added the sentiment and a little white twine bow and adhered to a pale blue card. MOOD WHEN DONE = Having an excellent day! Hope you are too. Definitely a day-brightener! I hope your day is marvelous. I'm glad you're having an excellent day. Today is tax day for us, and more stamp room painting, but I don't think it will be a bad day. This card is a real pick-me-up with it's pretty colors. I love your style!